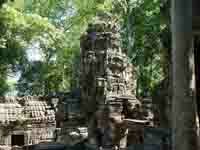 It's about 160 km northeast wards via the city of Sisophon to the huge Banteay Chhmar temple complex. Enjoy the journey through the rich farmlands and the scenery of rice fields, water buffalo and authentical Khmer village life. Banteay Chhmar temple was constructed under Jayavarman VII, at the same time as Angkor Thom. 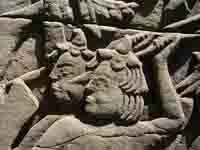 Study the fantastic bas relief with scenses depicting historic battles against Chams. 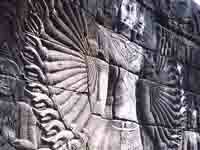 The reliefs are very beautiful in the late afternoon, with the best sunlight. The reliefs of "thousand armed" Bodhisattva Akalokiteshvara are world famous and can only be found "in situ" in Banteay Chhmar! These highlights deserve to be visited and complete your Cambodian experience! In the late afternoon, visit nearby Banteay Thorp, set admist rice paddies. Retun to Siem Reap, finis one day visit. Accomodation is not included, as this is only a day tour.